Do I upgrade to Oracle R12 or wait For Fusion? 1. Business/Functional Processes or Modules implemented – Obviously, one of the first questions to ask is whether the new Fusion Applications can even meet the needs of the business as they exist today. Currently, Fusion Apps is limited to only a few modules and a very careful thought needs to be put into answering this question. 4. Indirect Cost – How much would it cost to purchase and implement the infrastructure that is necessary to support it. Fusion applications is built on cutting edge technology and consequently, the hardware required to support it needs to be that much bigger – big enough that it might pinch when combined with all other costs. 5. Internal Staff/Long term support – As mentioned above, fusion applications is built on cutting edge technology and requires the right expertise to be able to support it long term. Does that expertise already exist? If not, how long would it take and how much would it cost to build that support. 6. Data retention – What are the goals of the company in terms of the retention of the current 11i data? Does all that data need to be maintained in the new system or will this data be archived or will there be a cut-off that will determine what data gets archived and what data gets migrated? This might seem to be a very innocuous question to ask at this stage, but it should be understood that Fusion is a completely new architecture & way of working. This means that a straight-forward migration of data will not be available and one does not want to get caught unawares half-way into an implementation and realize that it is not possible to migrate some critical elements of data. 7. Early Adoption – While Fusion is generally available, it is still in a very early stage and only organizations that have the capability and bandwidth to provide extensive support are willing to act as early adopters. If you are not on R12 already then it is very unlikely your organization has the appetite to be an early adopter and so there is no real choice for you, the answer is to go R12. Fusion is a completely new architecture and way of working, it is not a straight forward either or choice. The decision to transition to an ERP system and replace in-house or legacy business applications & processes is one of the toughest calls for senior management or any IT head. A glitch-free setup & proper business alignment will warrant drastically improved returns & process efficiency. But a few slip-ups and the whole process can fail even before you realize what went wrong. The entire process right from the selection of an ERP to the post-implementation phase has many pitfalls which are easy to spot & steer clear of, if checked in time. Based on our years of experience with customers worldwide, here’s a quick guide. Should you opt for EBS R12 or Fusion Applications? You have a decision to make: extended support for Oracle E-Business Suite (EBS) 11i is going to end soon – should you opt for EBS R12 or Fusion Applications? It’s easier for SAP users, who have one single core ERP product to choose from. But Oracle offers two viable options: upgrade to the latest Oracle EBS R12 (either 12.1.3 or 12.2) or switch to Fusion Applications. This has presented a real dilemma to quite a few organizations, as is also reflected in various online debates (such as this Oracle ERP group on LinkedIn). It’s built on a service-oriented architecture and SaaS model. All in all, it certainly isn’t a bad choice. Fusion is great but, if you’re using EBS 11i now, upgrading to R12 might be better as an initial step. R12 runs on Fusion Middleware – just like the Fusion Applications do. This means that you can upgrade to R12 and immediately enjoy some of the most advanced ERP functionality available, while also gaining a platform that is very similar at its foundation to Fusion. Your upgrade will be relatively painless compared to bringing in an entirely new ERP (especially if you use an Upgrade Automation solution), and you can then start bringing in aspects of Fusion Applications at a measured pace (such as Fusion HCM), getting just the parts of it you most want at first, and then eventually building toward a system that is completely Fusion. Fusion may be the future of Oracle’s ERP offerings. It’s a future that many Oracle EBS “shops” should consider embracing in the foreseeable future, but you don’t necessarily have to make the leap immediately. R12 gives you so much, not the least of which is a convenient entry point to Fusion Applications in an easy and controlled manner. BRIGHTSTAR Support Services Program consists of a dedicated team of Certified Oracle Professionals in the BRIGHTSTAR corporate headquarters in Pune, India and Nearshore office in Bucharest, Romania. Expertise – The vast network of clients and field consultants keep BRIGHTSTAR on the leading edge of Oracle technologies. The BRIGHTSTAR collaborative culture places the collective knowledge of all BRIGHTSTAR professionals at the customer’s disposal. It is simply not possible to replicate this level of experience through internal staffing. Flexibility – Customer support needs vary from month to month. With BRIGHTSTAR, support time can be utilized for a variety of different business needs – as support requirements grow or shrink, BRIGHTSTAR works with customers to structure the optimal contract. Scalability – Support contacts can be matched to your exact requirements — task-based services, on-demand, fixed hours per month, or all-inclusive annual support contracts are available. Accessibility – Support is available 24 x 7 and can be reached by phone, email, or through the web, a BRIGHTSTAR expert is ready to help. Delivery Management – A dedicated Service Delivery Manager is assigned to each account. This single point of contact can be used for budgetary reporting, consultations, escalation management and delivery management. The BRIGHTSTAR Service Delivery Manager is a trusted partner that helps their customer proactively manage their organization’s Oracle footprint. Cost and Risk Reduction – BRIGHTSTAR Support allows customers to control and reduce ongoing Total Cost of ownership, control and reduce support costs, enjoy guaranteed service levels, reduce operational risk of dependency on individuals, and reduce the need for in-house training or knowledge. The modern cloud provides an evolutionary approach that progressively generates value from your application investment. 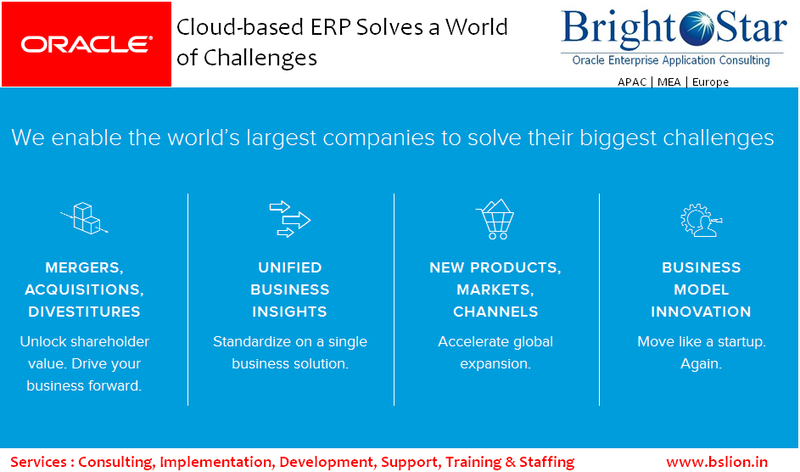 Trusting a leading partner like BRIGHTSTAR as a single source for Oracle Cloud reduces cost and complexity, exploits best practices, maximizes service quality and brings technology innovations that improve your business performance. 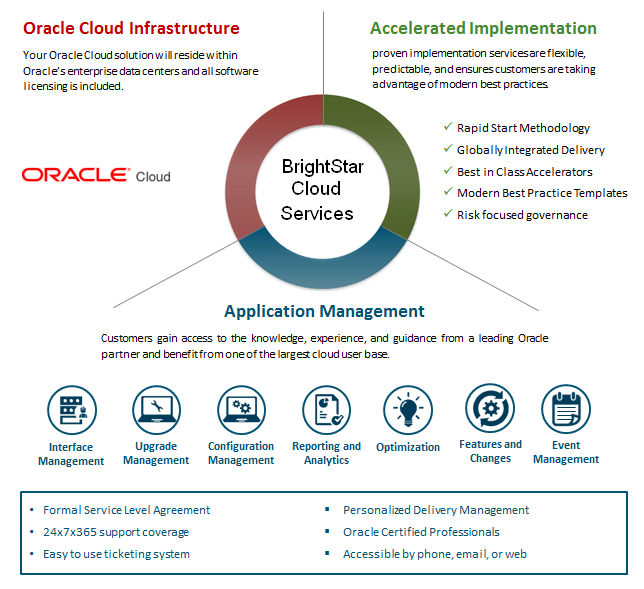 BRIGHTSTAR Full Service Cloud AMS provides everything you need to take advantage of Oracle Cloud in a fixed, per employee subscription model. Oracle Primavera has just released version 15.1 of it’s flagship project management & scheduling software Primavera P6. But for the many who are users of Oracle Primavera software products, this release might come as a big surprise – especially since the last release (2014) was version 8.4. But don’t fret, there’s a simple explanation to a seeming jump of 7 major software versions over the span of only 6 months. The Primavera business unit is rebooting its software release numbering, starting with this release, labeled 15.1. The reasons, as Oracle Primavera explained on a recent broadcast, are focused on the increasing integration between the Primavera software products. The new numbering will hopefully allow for less confusion around what version of a given Primavera product will integrate with another. So for example, if your company is a user of Primavera P6 EPPM software, and you are looking to implement Primavera Analytics reporting, then you will have to align both tools on version 15.x to allow for the integration to work. Or perhaps you would like to take advantage of Primavera Unifier’s ability to manage costs alongside your project schedules in Primavera P6 Professional (windows). Then again you will need to ensure your company has the same compatible versions installed to achieve these 2 products working together in an integrated fashion. Here’s a visual of the new strategy. Version numbers will now be aligned to the year they were released. Releases in 2015 are 15.x. Releases in 2016 are 16.x. Primavera P6 will jump from release 8.4 to 15.1. Unifier will jump from release 10.1 to 15.1. Primavera Analytics will jump from release 3.4 to 15.1. Primavera Gateway will jump from release 14.2 to 15.1. Primavera Prime will jump from release 14.2 to 15.1. Instantis will jump from release 9.0 to 15.1. Oracle Primavera Portfolio Management (this is not P6) will jump from release 9.1 to 15.1. Primavera Contract Management will not adopt the new numbering and will remain on release 14.x. What is Changing in Versions 15.1? Oracle has stated that the jump to version 15.1 is identify to a minor update for their software. So, in the case of Primavera P6, jumping from 8.4 to 15.1 is the same as moving up a minor release to 8.5. There are no major platform or architectures changes as a result – it more cosmetic than anything. This new approach to Primavera software releases will simplify the lives of large customers who are implementing many Primavera products with the intent to have them integrated and working together. Companies will have to simply align versions to get the benefit. In terms of software development and support, it sounds like Oracle Primavera doesn’t want to focus much of its bandwidth on backwards compatibility of versions. The onus is on the customer to align versions. Customers who aren’t paying annual maintenance fees to Oracle, which grants them access to updates and new versions at no cost (some exceptions apply – I’m not an expert on this) may have to shell out additional capital to upgrade their existing Primavera products if they are striving for an integration. However, that may be nothing new – many companies are slow to upgrade and tend to stay on a stable version of a Primavera product. However, adding backwards compatibility can often bloat an application and reduce performance as well. As businesses expand into multiple countries, geographies, and subsidiaries, company leaders need to ensure that their ERP systems are able to support and enhance their new business models. This means identifying the system that is not only right for your business today but also which will be able to support your business as it grows—whether as an integrated global company or as a more distributed organization with regional businesses. In this article, we take a look at some of the fundamental questions informing this decision. What kind of financial consolidation will we need? Financial managers at corporate headquarters need consolidated financial information to provide the complete business overview that shareholder and financial authorities require. Multiple locations give rise to multiple sets of reports—all of which need to be consolidated. A global ERP system makes it easy to automate consolidation and mitigate the errors that inevitably creep in when reports pass through multiple hands. To get the best out of a global ERP system for financial consolidation, executives need to consider how the system will support the business model. This could mean a fully integrated model where all locations and subsidiaries run a single instance of the ERP system, or a regional model where a number of regional businesses run their separate systems and provide consolidated financials to the head office on a periodic basis to be reconciled, or a hybrid of the two. However, the problem with the second scenario is the mushrooming of a plethora of non-standard solutions around the company which will lead to lost time and productivity and increased risk of reconciliation errors—thanks to manual data transfers across multiple local systems. Bottom line, a global ERP solution needs to be flexible enough to support the expansion model that fits your particular business needs whether your business is undergoing geographic expansion, product line expansion, new subsidiaries, new channels, etc. How will the ERP system handle different currencies, taxation and legal frameworks? When it comes to choosing a global ERP solution, another key consideration for any organization that operates internationally is whether the system can handle multiple currencies, tax regimes and legal frameworks. Currency exchange rates, for example, become a big factor as businesses cross borders. Transactional taxes, such as VAT and GST, apply differently in various countries. Financial reporting requirements vary from country to country. And changes to local legislation can have far-reaching consequences on international business. The right global ERP system for your organization will have demonstrated success in the countries where your business operates (and also where you might likely operate in the future). It should allow for regional differences to be addressed automatically in a single instance and for updates to be rapidly deployed in response to changes in exchange rates, taxes and business regulations. How much visibility will the system provide? A need for effective financial consolidation as well as tax and accounting compliance often drives the move to a global ERP system. However, the benefits of such a system are not limited to financial management. A global business management system can also help your business streamline and standardize operations from supply chain management and inventory control to customer relationship management and invoicing. More standardized processes will mean more control over operations and greater visibility into those operations from the head office. The right system for your business will enable you to standardize processes where necessary while still allowing flexibility and decentralization. 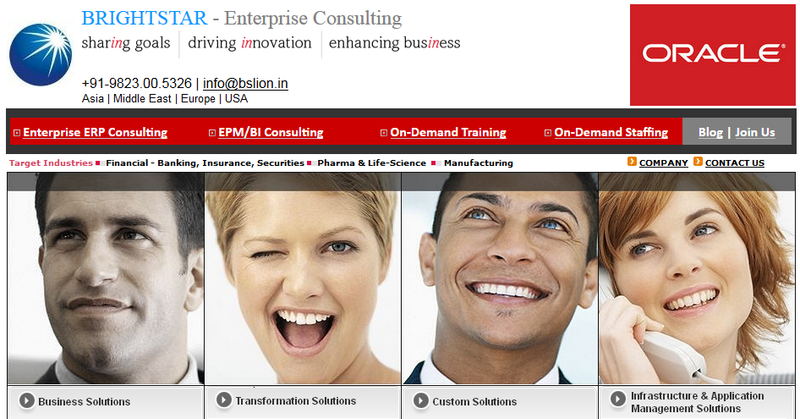 What kind of customization can the ERP system provide? It may seem strange to discuss customization in the same breath as standardization, but every implementation of your global ERP system needs to be customized to your specific business, your locations and your objectives. Local employees need to view dashboards and data in their own language and currency, and some local business workflows need to remain in place—without the delays and added costs that result from requiring headquarter’s IT support to implement all of those subsidiary changes. Eventually, however, you will need a seamless roll-up and consolidation to the global level. Since every stakeholder needs a consistent view of the information, all calculations and consolidation should be performed using the same underlying database. The vendor of your global ERP system should be able to provide examples of successful implementations that involve multiple language, currency and business-flow customizations while also satisfying global reporting requirements. Will the ERP system be able to scale as my business grows? Scalability is all about how the global ERP system enables and supports your business as it grows. A centralized system, with customizable instances for each new business interest, makes it quicker and easier to establish business processes in new locations. Your ERP software should support the growth of your business, not constrain it. Can my new ERP system coexist with an On-Premise ERP System? Businesses have often invested heavily in local, on-premise ERP solutions. Therefore, it is imperative that any new ERP system you bring on to manage your global expansion co-exists with your prior headquarters system because, as you know, there is a lot of legacy data in the system which you simply can’t move into the new system overnight. A two-tier implementation enables such businesses to keep their existing systems while introducing more agile, cloud-based global ERP capabilities for new subsidiaries and divisions without disrupting ongoing operations. The right solution ensures complete synchronization between the two, ERP systems. Moving to a global ERP system can appear daunting, but with the right solution and an experienced provider, it can help unleash your business’ true growth potential. At BrightStar Enterprise Application Consulting – we have a strong track record of providing flexible, reliable global ERP systems. 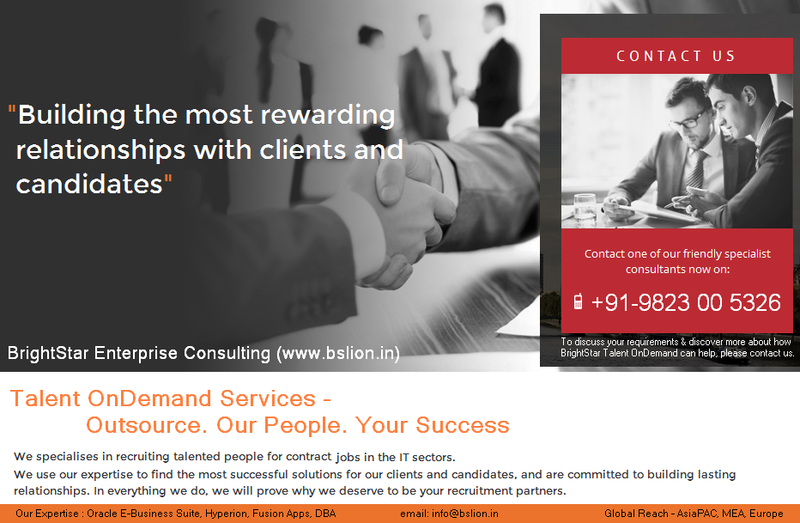 Contact us at info@bslion.in or visit http://www.bslion.in to see how we help businesses everywhere make a smooth transition to a global ERP solution.